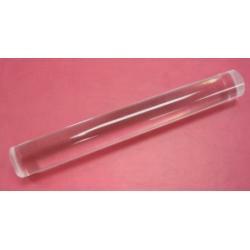 PME Polyethylene Rolling Pin 9"
Rolling Pin - White 20"
Free Shipping - Flour Confections offers free shipping on orders over $90 anywhere in Canada and the continental USA*. This offer is only applies to orders where free shipping has been selected as a shipping method. Free shipping cannot be combined with any discount code. Flour Confections reserves the right to choose the shipping carrier and type of service. Overnight, Priority and sameday shipping services never qualify for free shipping. Depending on your location, delivery can take between 3 to 10 business days, possibly longer for remote destinations. Delivery location exclusions; Non-contiguous states of Alaska and Hawaii and all off-shore US territories and possessions, which include American Samoa, Guam, the Northern Mariana Islands, Puerto Rico, and the United States Virgin Islands. Also some postal codes within Canada are considered remote and will therefore be subject to a flat rate shipping fee of $12.95 CAD (plus applicable taxes). The below table represents remote locations subject to this flat rate fee by province and postal code. *Free Shipping delivery location exclusions continued; Canadian Teritories - NWT, Yukon & Nunavut and are subject to an Flat Rate shipping of $150.00 plus tax. Note; In some circumstances where the shipping charges are extremely high, we may ask the customer to pay for more than the flat rate. In these cases, you be contact prior to shipping your order. Due to extremely high shipping costs, residents that fall under the P0L postal code are required to pay full shipping fees. *While most orders ship in a few days, exceptions do occur such as exotic colored products, or orders requiring proof approval - but we'll keep you posted! Some products ship from the factory based on your order alone and delivery times can vary from a few days to a few weeks depending on inventory levels. Shipping times vary by greatly by brand. Product availability is subject to change between the time that an online order is placed and the time of fulfillment. Customers will be contacted should there be any difficulty in completing their order. Funds are collected at checkout and will be refunded to your method of payment in the event we cannot complete your order. Would you like to shop in US Dollars? No thanks, I'd like to proceed in Canadian Dollars. Just add Flour™ to keep up to date.